Paragliding courses in India & Internationally rated school :Temple Pilots. I remember when I first got airborne with my Instructor in a sailplane when I was a teen. It was magical and the only thought was - everyone should be flying! It was an outworldly and liberating experience. I went on to fly many aircraft including supersonic fighter jets for the Indian Airforce. Flying fascinated me immensely. Once I was on a paraglider cruising high above the Dhauladhar Himalayas, mesmerized by the stunning scenery when the impulse to share the beauty of flying was reborn. 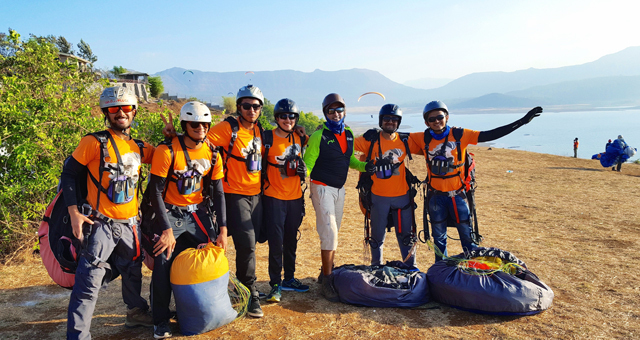 I came to explore the Sahyadris for paragliding and found Kamshet, between Mumbai and Pune, to be an ideal destination to set up a Paragliding School. Anita & I were blessed to have a common passion for the life outdoors. We knew we were not alone in our dream to get people outdoors, to share the love of nature and discover ourselves through flying. Together we dreamt to have Indian pilots in the Indian skies and Temple Pilots was born. How we decided upon this name is very interesting, explained in this website. Adventure sports were very new in India in the early 1990’s. We still don’t have a culture of adventure sports in our country. So we knew a big part of our job would be to change mindsets. We focused on answering questions and clearing misconceptions. Our motto was 'Safety first', that we maintained throughout training our team, getting equipment and continue our efforts to reach International standards. We are happy today to be an Internationally rated school with licensed Instructors. Slowly but surely we could see a wonderful community of amazing people and pilots unfold. They were game changers, wanting more from life. Realizing the power of the Outdoors and how it could enhance their lifestyles. Most became the closest of friends. As our flock grew, we came up with a novel concept of buying pure airtime, without having to invest in expensive equipment. 'Flying Hours' - where one could continue flying under supervision after training was done. This also led us to organizing ‘Flying Tours’. We now wanted to take our trained and skilled pilots to new places in India and abroad. Not only to conduct Advance courses like SIV and Thermalling but also "Paragliding Holidays" to share with friends and family. We have now been conducting flying tours for the past15 years. Flying for us is now is a celebration. Our School & Club has an exciting mix of new baby birds to experienced flyers. We could also see the possibility of paragliding becoming a spectator sport. From here was born our Annual Flying Festival. The idea was also to promote and share the spirit of our wonderful sport. Club pilots would invite their families and friends and compete in friendly contests for fun. This would be followed by awards ceremony, dinner and dance parties. As we look back at this amazing journey, Anita and I have had such fun! We feel truly blessed and our life has been a gift of grace by Mother Nature. Temple Pilots is driven today by the goodwill and friendship of our pilots. We are reminded everyday of how magic of flying brings together the best of people. Pilots who enjoy flying and love to teach run Temple Pilots. 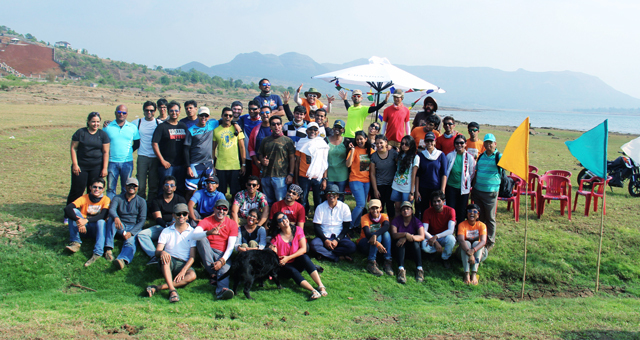 With our young team and an active Club, its all about fun, adventure and laughing together. Together we dreamt to have Indian pilots in the Indian skies and Templepilots was born. How we decided upon this name is very interesting, as explained on this website. Adventure sports were very new to India in the early 1990’s. We still don’t have a culture of adventure sports in our country. So we knew a big part of our job would be to change mindsets. We focused on answering questions and clearing misconceptions. Our motto was 'Safety first', that we maintained throughout training our team, getting equipment and continue our efforts to reach International standards. We are happy today to be an Internationally rated school with licensed Instructors. Slowly but surely we could see a wonderful community of amazing people & pilots unfold. They were game changers, wanting more from life. Realizing the power of the Outdoors and how it could enhance their lifestyles. Most became the closest of friends. Paragliding is an adventure sport and when you choose a paragliding school to learn to fly, it becomes paramount that you check the credentials of the School and the Qualifications of the Instructors. Temple Pilots is a registered and operating school, license no.9 with APPI International – (Association Of Professional Pilots and Instructors, Switzerland), as we have satisfactorily met the certification standards set by them. This also means that we will be able to provide you with an Internationally recognized APPI Pilot License after completing your certification. Temple Pilots is the leading paragliding training school in the country which provides the best paragliding education and conducts basic to advance level courses. FAI: Federation of Aeronautique Internationale lays down rules and regulations for aero-sports all over the world. In India, it is represented by ‘Aeroclub of India’.Temple Pilots is the only registered school in the country as an associate member of IPF – Indian Parachuting Federation, which is a registered member of Aero - club of India. A. The Chief Instructor is an ex-Air Force fighter pilot with 22 years of an aviation background. The CFI, Chief Flying Instructor has thousands of hours solo and tandem flying and 14 years of training experience and the Senior Instructor has over 8 years of experience. B. Temple Pilots Flight Training Program is a step by step, a well-structured program that makes learning to fly easy and a fun experience. C. Temple Pilots issues a “Club pilot license” to pilots who pass their Certification and Club Pilot Rating after completing all witnessed tasks and passing their written exam. Pilots are also provided with APPI International Pilot Card which is recognised worldwide. D. Temple Pilots offer a full range of paragliding courses from Introductory to Advance levels. Special Skills Clinics like Advance Kiting Clinic, Progression Course, thermalling & XC(Cross Country) and SIV courses. A. Temple Pilots conducts training and organizes flying tours at various different destinations – Kamshet, Maharashtra, Bir/Billing, Himachal Pradesh in the Indian Himalayas; Bali and Java, Indonesia, Pokhara, Nepal Himalayas and Yellagiri in Tamil Nadu, South India. A. We take care of teaching you at your own pace, keeping in mind your fitness levels and your aptitude. B. 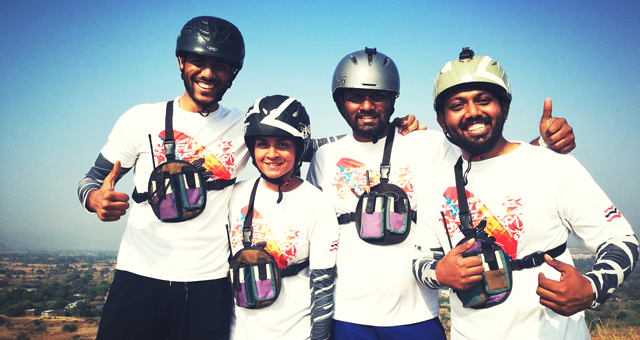 'Safety First' is our mantra and we extend this to all aspects of paragliding – equipment, skill & knowledge and attitude. C. We are committed and dedicated to make safe, competent and confident paragliding pilots and have a 100% safety record. D. We have a dedicated Safety Officer at the flying site to maximise safety. The team is EFR (Emergency First Responder) and First Aid Certified and the Chief Instructor is a qualified EFR+ First Aid Instructor. E. We are associated with the best Hospital in close vicinity with a 24/7 fully equipped ambulance service. Temple Pilots is a team of nine Instructors. This ensures a very good instructor to student ratio. Personal attention and care for each student is our priority. Senior Instructors are APPI Qualified Instructors and also have international sporting licenses from the FAI. There are qualified Instructors in all disciplines of the sport that includes Tandem, Cross Country, SIV, and Acro. They regularly update their skills by participating in advance skill workshops and courses. A. We have certified gliders from the top brands for training, for all weight ranges and pilot experience levels. B. Each pilot in training gets their own flying gear which includes – glider, harness, helmet and radio. C. Temple Pilots provides a flight log book, a certification task book and a training manual to continue training after school. D. We also conduct theory classes for all levels of training, so that you can learn and perfect not just your flying skills but consolidate that with aerodynamics (principles of flight), airmanship (rules of the air) and understand micro-meteorology (the weather). We look after all your pilot needs even after you graduate from our School: A. We supply you the internationally certified equipment, as we represent the top brands worldwide. B. We offer you our Club membership so you can continue flying safely in a club environment and make great flying friends. C. We regularly conduct advanced level courses to enhance your piloting skills and guide you to take your flying to higher levels. D. We regularly organize "Flying Tours" to exotic destinations both in India and abroad. E. We constantly keep you updated on the latest techniques in the sport and keep you abreast. We continue to evolve our training methods to make learning and mastering techniques for our students easier and fun. We use the best brands in the paragliding world like NIVIUK (www.niviuk.com) We also represent international brands like GIN, Skywalk, Windtech, etc. All equipment is test flown and certified by international organizations like the German DHV, European LTF and EN.